I came across this paperback in the Murder One (mystery, SF and romance) bookshop, on Charing Cross Road in London, the basement of which, the SF collection, could be a perfect mausoleum for me. Just leave me there, brick up the staircase, and let me RIP (read in peace). Sidetrack for UK readers: I spotted the actor Richard Wilson in there some time ago and felt a strange desire to sidle up to him and say ‘I – don’t – believe – it!’. Now I’m totally non-starstruck in such respects, and it really did feel as if some bizarre force was upon me. I read recently that he has taken to demanding money for charity for uttering his Victor Meldrew catchphrase – probably the only way he can keep his mental health. The book came via Southwark Libraries, and I am trying not to think of how many hands this book has been in. I spent a year working in a public library, and believe me, you do not want to know about the condition in which many public library books are returned. Suffice to say that I have been a librarian for 20+ years and I do not use a public library. But I digress..
We shall draw a discreet veil over the cover, very much in the manner of the discreet veil thrown across the coverbabe’s lissome form. The book contains the Hugo Award winners for the Best Short Story, Best Novellette and Best Novella, for the years 1992, 1993 and 1994 (1992 thru 1994 for American readers), with linking text from Gregory Benford. In this novella, subsequently turned into a novel, In-utero genetic modification allows for removal of the need for sleep. The Sleepless grow up academically gifted and gradually become cut off from a resentful society. I read it some years ago and thoroughly enjoyed it, but skipped it in this volume. A sentimental choice perhaps? Read some twenty years later it feels a little leaden, belonging to a decade or two earlier perhaps? The story ponders the nature of the muse, in which a director who is used to computer-assisted actors takes on a script with purely dialogue – no description or characterisation whatsoever. What can the famous director make of such a script? A pilot is stranded on the Moon following a botched landing, and is left with no means of survival – oxygen and food are no problem, but her spacesuit is solar-powered, and night is falling. How can she survive until help arrives? Best Novella: Barnacle Bill the Spacer, by Lucius Shepard (Asimovs July 1992). Probably my pick of the volume. Interestingly, very unlike a lot of Lucius Shepard’s work – I would not think many could rightly guess the authorship if read without knowing who had written the story. The early part is in some places suggestive of Cordwainer Smith, but then (which I feel weakens it slightly) it moves towards a dramatic conclusion which reminded me of the finale of Outlands, with Sean Connery as the space station cop. Some of the dialogue between the main characters is acutely observed, far beyond the norm for SF. Best Novelette: The Nutcracker Coup, by Janet Kagan. (Asimovs, December 1992). Ethnologists somewhat inadvertently and indirectly bring the question of ‘human’ rights onto a planet (named Rejoicing) in which the indigenous population are cowed by the ruler. Best Short Story: Even the Queen, by Connie Willis. (Asimovs, April 1992). An extremely well written piece of storytelling, focussing on the relationships between and across generations of female members of a family. The biological issue in question, and the opportunity to have a choice in the matter, is the fulcrum upon which the story balances. Best Novella: Down in the Bottomlands, by Harry Turtledove (Analog, January 1993). Another extremely good read. A vividly described desert canyon is the setting for a tour party, drawn up of a variety of races. Politics and religion play a part in the interactions, and lithe, nubile nymphettes engage the main character in troilistic naughtiness which leaves him nonplussed (and tired). The story gradually builds up to an inevitable crisis, and its a hold onto your hats ride from there on in, in stark constrast to the sedate donkey trekking at the beginning. Really good stuff, and deceptively well written. Best Novelette: Georgia on My Mind, by Charles Sheffield, (Analog, January 1993). Those working in IT, or with an interest in Babbage’s early experiments in ‘computing’ will particularly enjoy this. A scientist stumbles upon some evidence that takes him to New Zealand, and potentially to even stranger shores (and if you know NZ then you know that that must mean some really strange shores). The use of 100yr old diary entries is handled well, with an odd sentence here and there moving the story forward quite suddenly. Read closely. Enjoy. I did. Best Short Story: Death on the Nile, by Connie Willis (Asimovs, March 1993). SF? Horror? Crime? Fantasy? Agatha Christie? All of these, and more. Pretty damn good value for money: all the above for the price of a pint of beer. Something there for most people, I would imagine. Six of the nine stories I had read previously, their having been collected in Years Best anthologies. Of the three I hadn’t read the Lucius Shepard and Harry Turtledove were particularly enjoyable – good stories of a good length. I would say that with the exception of the Asimov story, the remainder could all be put forward quite happily as being very good examples of short SF and worthy of their status as Hugo Winners. 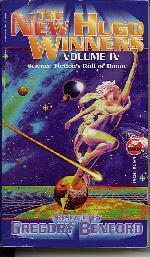 And if the Asimov story isn’t quite that good, then look from where the bulk of the stories originated. If you are looking for more information about Hugo Winners (and other Awards) then get yourself over to the Locus Index to Science Fiction Awards which I used to get the details of the nominees against which to put the winners in context.